It's been a long time since I have been geocaching due to work, but now I am getting back into the fun! I have been asked to help put together a state wide geocaching event for Indiana's 200th birthday. What I had in mind, was for each county to have a geocache set out with information on the history of their county and anything of historical interest. I would like to have input from fellow geocachers on this and once this gets rolling, I will need a rep from each county who will be the actual contact person for the county and responsible for the cache itself. My first question is of course.. Does this sound do-able, and do you think there would be an interest in going forward with this? Thanks for any and all suggestions and input! Sounds like a winner to me! Count me in for Posey, Vanderburgh, Warrick or Gibson which ever need covered. I will be keeping a spreadsheet on who can cover what counties. We have plenty of time to get this all organized so I will keep updating as I update the file. I am also working on trying to get the committee to buy a commemorative geo coin for the event.One for each county to put in their geocaches... keeping my fingers crossed there.. This is very exciting and doable!! We'll take care of Wayne County (we can also do Fayette, Henry and Union if no one else steps up to claim them). Wayne County actually has a series of eight caches called the Wayne County Hidden Treasure Series that we placed in 2009. They take you to historic and special places around the county and if you find all eight (and provide the code words) you can get a special pathtag for completing the series. We worked with our County Tourism folks on that series. Pretty sure they would be willing to help with this project as well. Actually you might be able to get several of the county tourism bureaus to work together on reward coins much like what Pennsylvania has done on their Allegheny GeoTrail series and the Great Lakes Seaway Trail series. Both of these programs are fantastic and have generated a significant amount of tourism for their respective regions. Don't know if you are active on Facebook or not, but if you would like I can post your information/request on the Indiana Geocaching groups that we are part of on Facebook. Much of the GC.com forum activity has moved over to Facebook. Pretty certain that within hours of posting it on Facebook, many of the counties would be claimed. Are you also aware of the Indiana Epic 92 County Challenge? It is a special cache that you can claim after you've found at least one cache in each of Indiana's counties. It might be a good thing to tie into all of this. Thank you for the input! Those are great ideas! I am very active on FB, so post away! I will check on the information you have listed and I think it's a great idea to get the county tourism offices involved as well. I will put you down for the counties you listed until I get more volunteers. Is there are particular county you prefer if it came down to picking one? Same for you Hoosier Guy... do you have one you prefer? Our first pick is Wayne County. Let us know how we can help as this project moves forward. We have worked extensively with the Wayne County Tourism Bureau both professionally and personally, plus have contacts with the east regional group as well. If there is a plan, we can see about getting them to budget some things for us. Thank you Itchy & Scratchy! Will keep everyone posted. Rather than just putting one coin in each county cache, you may want to consider having a special stamp in each cache and awarding the coin to people who get all–or at least a certain percentage–of the special caches (proven by having the respective stamps on a form or passport). That way you can limit the coins to one per person. Otherwise there will likely be a mad rush by people racing from county to county trying to collect as many of the 92 coins as they can. Count me in. I will be glad to help with Clark County. If you need help in any of surrounding counties, I don't mind taking a couple if no one steps up. Like Itchy and Scratchy, we did a nice challenge put on by the tourism bureau in Pennsylvania. There are several others across the country that you can look at for ideas. Most people working with these challenges are willing to share information. Give me a shout if you need additional help in planning. Yes, occassionally I play dress-up. Count me in. I will place one in Allen County. If you are running short on any of the counties in Northeast Indiana, I can help out with those as well. I can take Hamilton county. I also second Team I&S' idea about a stamp or code in each cache rather than having one for each separate county. Each county could possibly provide some sort of county swag (get in touch with the county tourism bureaus) for each cache. The coin would then be the reward for finding all 92 counties' caches to celebrate the 200th birthday of the state. I will take care of Clay County. I also will take care of any county nearby that needs it. We'd like to do it. Count us in for Jefferson County. Count me in for Koskiusko County..
Wow! Thank you guys for the ideas and stepping up to help out! I have each of you down for your preferred county plus a note on extra counties if you provided that info. I like the stamp idea, but not sure of being able to come up with 92 unique stamps. I will have to look into that a little more. I'm sure it would be cheaper to go that route, than 92 unique geocoins. I am open to suggestions from some of you with experience in this area. I also want these to be larger caches. Something big enough to hold historical info on the county they are in. When I first started Geocaching, I located one in Vincennes, IN that held a notebook covering the history of Vincennes and also had items of historical nature. I thought it was a really cool cache and one of the more memorable ones I've ever found. I don't expect anyone to put together an elaborate notebook, but pamphlets on some of the local history attractions, or anything that would tie the cache to the county would be great. The local tourism boards would be a help in that area I'm sure. Not sure I was clear on the stamp idea. You can have mini-self inking stamps made fairly easily and inexpensively. Some cachers are using those to sign the logs with these days. The stamps would remain in their respective caches. Geocachers would pick up passport books and would need to collect as many of the 92 county stamps as they could by finding the designated caches and stamping their passports. You could use a rubber stamp and a stamp pad, but that can get a little messy. Another alternative is using the special shaped hole punches you can buy at craft stores. But since there are only a limited number of designs of those, it makes it much easier for someone to cheat and find out what shaped punch they need for which counties. You would also need to have a few replacement stamps or hole punches on hand, because it is a given that some of them will grow legs and walk off. There could be lots of ways to set up the coin reward. Having to find all 92 counties just for one coin might be a little extreme. And while 92 coins sounds awesome, it is probably not doable financially. You could designate regions and have a different coin for each region. If you had 4 regions made up of 23 counties in each region, you might require cachers to get 15 out of the 23 county stamps to earn the regional coin. Having the backs of the coins all be the same, with the region side being a custom design would help reduce the cost of the program. 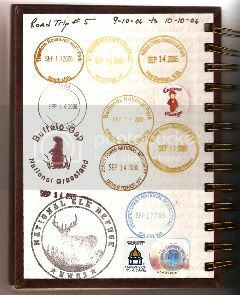 Here's a photo of a stamp journal that has a few examples of what the micro stamps could look like. Here's an image of the Seaway Trail geocoin set. The top center shows the common back used for each of the coins. The Romig Boys would like to volunteer for Bartholomew County and maybe some of the surrounding counties in you do not get anyone to take them. Thank you for volunteering all! I will not be able to reply as much as I'd like for a bit as we had a lightening strike here Thursday night which took out all our computers. I will update my file as soon as I'm back online and take a closer look at your info Itchy. Thank you all! Count me in for Wabash Co.
Ok I see no one has mentioned Rush County so I will take Rush County. Lots of counties taken around my neck of the woods. I would be happy to take Brown or Owen. Sounds like a great undertaking and i hope i can help in any way. You could have tiered levels of rewards. I like the idea of varying levels of rewards, particularly the zones/regions TI&S have mentioned and then having percentages in order to complete a region. 4 is the only # I can think of that divides evenly into 92, meaning 23 counties for each zone. 18 counties is roughly 75% of 23. Each zone/region would have a "reward" of some sort and then something for completing all 4 areas. I think there should be something out there, though, for those that go the extra distance to achieve all 92. Although there's already a county challenge for the state courtesy of indylovelace, I think the ultimate goal is to have cachers visit EVERY county in our state (what better way to celebrate our bicentennial than to visit every corner of the state!). You can count me in for Orange County and Dubois County. Although I don't live there now, I have roots there. Sounds like something I would like to get involved in! I can take care of Boone County if noone has taken it yet. This is a great idea! I would love to take Warrick County if Hoosier Guy is willing to let me have it. Sounds like a great idea. We can do Spencer county for sure. We can also do Perry county as there are no regular active cachers in that county that we are aware of. Many cachers do not read the forums often. Do you want the word spread for this endeavor? We could put the word out on a couple Indiana geocaching groups we belong to on Facebook if that will help. Just a link to this forum post so people know of it. Just let us know. Also I was wondering if a periodic list to the thread telling what counties have been committed to will help future volunteers know what counties still need help without scrolling through all the posts. Maybe I'm a little dense but what does TTT mean for this thread? Bringing this one back from obscurity. Sent an email to the original poster to see where, if anywhere, we stand with this project. I've been really busy at work too! I would love to help with the Clark County Indiana one!